Attack. Attack, attack, attack, attack. It was clearly a sign. Last weekend I was confronted with incontrovertible evidence that attacking is good. This wasn’t just on one front either; it was a multi-pronged attack on my brain. It all started with local MMA fights where a couple of guys from the academy were fighting, and ended with a world class jiu-jitsu athlete giving me the same message without the spectacle. Let’s start with the fight. Bert Forney is a blue belt and has been training longer than I have. Tough as nails and always ready to roll. Bert is the type of guy that you have to do things right to submit him. There’s no tapping to cheap submits, no tapping to submission attempts that aren’t locked in and perfect. There is no giving up for this guy. I’ve had tons of submission attempts on him that I thought were working, then gave up on after no tap, and only later found out that they were pretty good but not quite good enough to tear his head off . . . so he didn’t tap. Not exactly the kind of guy you want to square off against in a fight. He put on a show of jiu-jitsu for his first MMA fight that I wish I could see in UFC fights for every fight. He was also attacking when he was standing. His constant barrage of attacks kept the other fighter on defense, and even when the other fighter was attempting his own submission, Bert was calmly defending 100% with one arm and striking with the other. 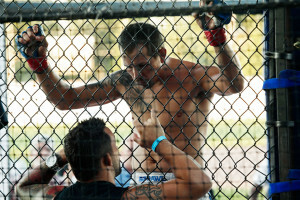 I lost count of the submission attempts, but the photos tell a story of jiu-jitsu in the toughest environment there is. Every attack meant time on defense for his opponent. 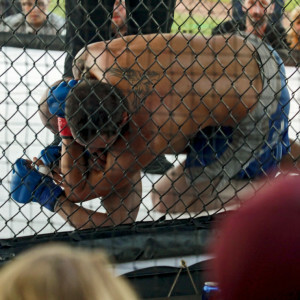 Although he couldn’t finish the submissions due to small errors in positioning (understandable given the scenario), his offense guaranteed his victory in a decision after three rounds. With so little time to work with, each submission attempt meant time in the dominant column of the ledger and less time worrying about taking damage. All in all, it made for an entertaining and thought provoking way to spend a Friday night. Then on Sunday, I attended a seminar by one of the top pound for pound jiu-jitsu athletes in the world. Andre Galvao is a beast on the mat, and his team speaks volumes about his ability to coach and think about jiu-jitsu. Towards the end of the seminar he pointed out that jiu-jitsu for self defense is not so much defensive as it is offensive. To demonstrate, he showed how a low straight leg kick can be used to create distance with your attacker. Then he pointed out that a standing choke from behind is dealt with by altering the angle and tossing your opponent. His basic theory of jiu-jitsu is to attack and keep on attacking. Playing defense won’t win the fight, but attacking will wear down your opponent until something works. When you view your strategy as attack so you don’t have to defend, other things he said make more sense. For example, he drills movements until he can execute them as fast as possible, even timing how long it takes to do a certain number of repetitions. This obviously gives a smaller window for good defense by his opponents and maximizes the number of attacks he can chain together. While new students are always cautioned to only do technique as fast as they can do it perfectly, once you get to a higher level, it makes a lot of sense to refine your speed in service of the already perfected technique. This concept of a constant barrage of attacks isn’t unique to Andre Galvao. 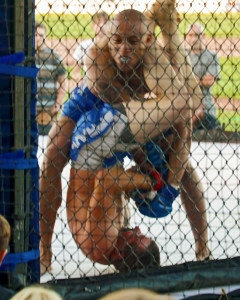 Top sport jiu-jitsu fighters often advocate being on the offensive and attacking submissions rather than playing defense. The point system is structured to encourage positional dominance and submission attempts, and there is a growing trend towards submission only tournaments or rules that give penalties for tactics that are only minimally offensive, like guard pulling. Aggressiveness and an orientation towards attack over defense is the ideal. It’s also good to realize that in a street scenario, defending yourself will likely involve attacking someone who wants to hurt you. If you look at the classic Brazilian Jiu-Jitsu books, you’ll see that the techniques labeled as “Defense to X attack” involve using the attempted attackagainst the attacker and the aggressor ending up either submitted or in a vastly inferior position. It’s good to have a strong defense. Things won’t always go your way. I’m reminded of this every time I spar with a black belt of any size. However, a strong defense is best viewed as a launch pad for turning the tables and getting into a position to commit to your own attacks. At the white belt level, students are subjected to a non-stop barrage of attacks from every skilled opponent in the academy. They have no choice but to develop their defensive skills. Once the defense is ironed out, it’s time to use it as a temporary safety measure to launch into escapes and attacks. Invariably the attacks or escapes will eventually fail, and they will indeed be used against the attacker via a counterattack. But you have to ask yourself, is it better to have a game based on invulnerable defense, or to learn to attack and compensate for the possible counterattacks? Only one will finish a match, and only one lets you attempt to dictate the direction of a fight. It has been a growing realization for me that while it’s satisfying to roll with a black belt and reliably survive, it’s far better to attack and learn the deficiencies of my attacks. At least then I can attempt to dictate the pace and direction of the sparring session, and I will learn the elusive skill of attacking a highly skilled opponent and simultaneously preventing them from counterattacking. When it comes to advice for my simplebjj students, I’ll still recommend building a strong defense first, especially since it’s easier to learn and will be used no matter how good you are at attacking. It’s just as important to point out that your defense is a temporary option, and your long term goal should be aggression and having a mindset of constantly attacking your opponent. You can’t give a skilled opponent time to think or they will have the time to evaluate more of the variables of the scenario and they will shut down more of your options. Just as speed is added only after technique is perfected, offense is added after defense is perfected. The moral of the whole weekend is that constant attacking wins, from local amateur MMA fights to street self defense to the highest levels of sport jiu-jitsu.